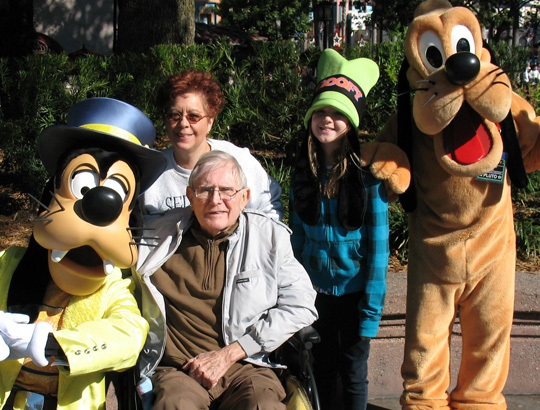 Before the dramatic change in my life during the past year, we frequently enjoyed trips to Disney with our granddaughter. Every year is a year of change, but some more so than others. Last year was a huge change for me. On a personal note, my ability to care for my husband at home changed. My husbands medical problems became unmanageable from home and it became clear that it was time for him to move to a nursing facility. This was a heartbreaking decision and one that I did not come by easily. I fought with doctors, replaced primary care physicians and changed nursing facilities, all with the intent of bringing him back home. But eventually change has to be faced. What you think you can prevent or overcome has to be accepted. In his book, Life 101, Peter McWilliams said, “Acceptance is not a state of passivity or inaction. I am not saying you can’t change the world, right wrongs, or replace evil with good. Acceptance is, in fact, the first step to successful action. If you don’t fully accept a situation precisely the way it is, you will have difficulty changing it. Moreover, if you don’t fully accept the situation, you will never really know if the situation should be changed.” Eventually I had to accept that our lives together would be forever changed. I was moving from the role of wife and mate to healthcare surrogate, advisor, advocate and caregiver. Some things did not change: my love for my husband, the joy he has given me and my desire to be with him. But acceptance truly is the first step to successful action and after much avoidance of what had to happen, I did take that first step even though I felt like I was walking off a cliff. As a Reverse Mortgage Specialist in Florida, I have encountered many seniors that cannot accept change. Yet often seniors experience more changes in their lives than any other segment of the population. As in my case, their spouses health changes, or in other instances they may experience a change in their own health. Family members may need to rely on them more, a spouse may pass away and a portion of income is lost (often a large portion), additional home assistance may be needed, mortgages become more difficult to pay, cost of living increases, home maintenance may be needed, 401K funds and investments lose value, medical expenses increase, funds for transportation may be required, the list is endless. And just like I experienced, it is difficult to accept. Often we feel loss of control and fight the inevitable, I know I did. Eventually, as in the words of Maya Angelou, “The need for change bulldozed a road down the center of my mind”, I moved my husband to a facility that is better equipped to handle his daily medical needs and started taking small steps of acceptance. Often my reverse mortgage clients are just like me, they make small steps toward reaching a necessary decision. It’s almost funny how often I hear, “I wish I had done a reverse mortgage sooner” or “why are all my friends so negative about reverse mortgages?” The answer is change, no one likes it, yet change is more often a good thing. A Pinellas county reverse mortgage client saved her home from foreclosure, a St. Petersburg client no longer has to fast to make her mortgage payments, a Clearwater client replaced her car with reverse mortgage funds and a Tampa resident replaced his broken air conditioner. In every case there was change, positive change and life altering changing. While most people would say “but these were desperate people that had nothing else”, this government insured program is not the loan of last resort, as some may think. It has been the means to pay cash for a second home eliminating mortgage payments, the funds for a retirement fishing boat and money for a grandchild’s college education, all additional circumstances which resulted in positive changes. With change as the constant, it is a matter of how you are going to handle the change. Are you going to follow my first reaction and try to stop it? Hide from reality? Deny it’s existence? Or will you exuberantly embrace it? For most of my clients change came first with an open mind, the willingness to learn the pros and cons of a reverse mortgage and the insight to realize the possibilities . . . the change of life that a reverse mortgage could provide. Maybe Oprah said it better than anyone, “If you want your life to be more rewarding, you have to change the way you think.” Oprah probably wasn’t talking about reverse mortgages, but I think the philosophy certainly can be applied. I’m not saying that you should run out and apply for a reverse mortgage today. I only ask that you are open to changing the way you think about reverse mortgages, about long term care, about retirement, about the future and discovering what rewards that may bring. Change truly is the constant, it’s just around the corner, are you ready? ← Have You Heard a Clock Ticking?